Book Jacket Synopsis: Alan loves animals, but the great cat house at the Bronx Zoo makes him sad. Why are they all alone in bare cages? More than anything, he wants to be their champion –their voice — but he stutters uncontrollably. Except when he talks to animals…Then he is fluent. Follow the life of the man Time magazine calls “The Indiana Jones of wildlife conservation” as he searches for his voice and fulfils a promise to speak for animals, and people who cannot speak for themselves. Why I like this book: This is one of the few books I’ve found for children who stutter. Alan Rabinowitz’ uplifting story focuses on courage, ability, healing, finding one’s voice and making a difference in the world. This is a very important message for children who stutter. The book is based on the true story of the author, who stuttered as a child. The narrative is in first person, which works very well as Alan deals with being put in a “disturbed class” and feels “broken.” He gets through school by using tricks that stutterers use. It is Alan’s remarkable relationship with animals who listen and understand him, that saves him. He talks to his animal friends at the zoo and his pets at home, without stuttering. He becomes passionate about the condition of zoo animals and makes a promise to be their voice one day. 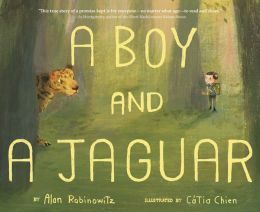 Rabinowitz finds his voice as he follows his passion to become a wildlife conservationist and saves big cats. It is important for children to see themselves in role models like Rabinowitz. Catia Chien’s breathtaking illustrations are lush and really evoke the emotion and loneliness felt by Alan. At the end of the book is a Q&A with the author about stuttering, bullying and his work with animals. Visit Rabinowitz’ website. Resources: I encourage you to visit the Stuttering Foundation for information, free resources, support groups, summer camps and a section that is devoted to kids sharing their stories about how stuttering has affected them — fabulous website. There are 3 million Americans who stutter, 68 million people worldwide. It affects males four times more than females. You will be surprised at the long list of famous people and celebrities who stuttered as children and teens. National Stuttering Awareness Week is May 11-17, 2015.